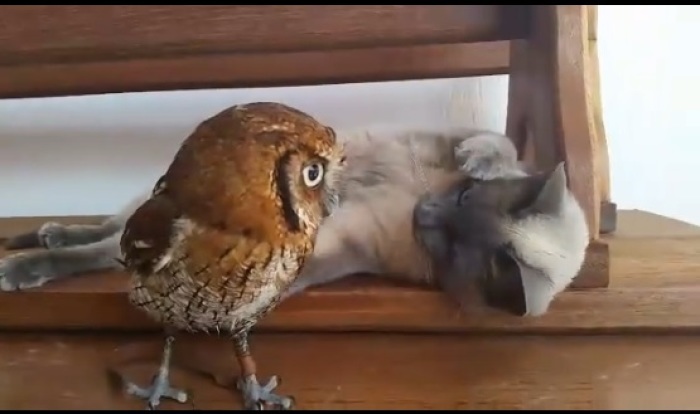 Cleo the Siamese cat and Forbi the owl have been together as friends since they were babies. It's a very unusual and unique relationship. As you can tell from this video, Cleo loves to play with the owl and the owl doesn't seem to really mind much. Because of their strong bond, they were able to grow up and deal with one another. They play each and every day and are never far away. An animal biologist owns both of these precious animals and wants to share their wonderful relationship with all!